All of this to ONE lucky reader! I also have something as a thank-you for all of your support and friendship over the year. Please visit tomorrow. Much of the support that I’ve received has come from the great brands I’ve come to know. Many of these were kind enough to contribute products for Bentley’s giveaway. 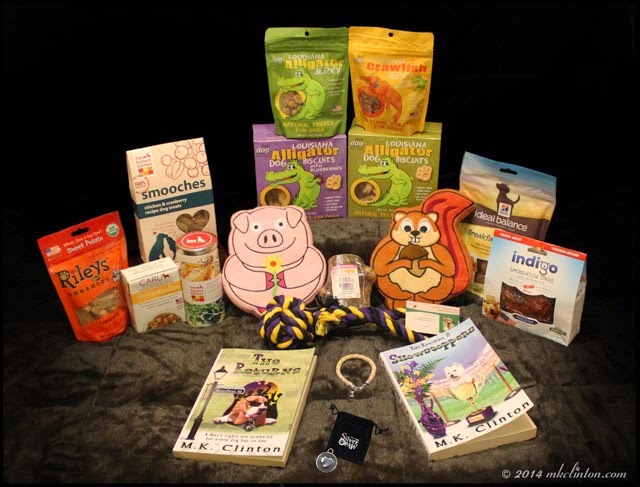 I thank each of the participating sponsors that helped to make this my biggest giveaway yet! Now since today is the last day to enter, let me show and tell you exactly what you have a chance to win! Don’t miss your chance to win! It’s Friday and that means it’s time for our Pet Parade! Don’t hesitate to join in the Pet Parade. Remember, you don’t have to play an instrument or twirl a baton…there’s not even any marching in straight lines required! It is just fun to share your favorite post with others. As always, I am joined in the co-hosting duties with Rascal and Rocco, Basil the Bionic Cat Blog, Love is being owned by a Husky, and Jan’s Funny Farm. Hop along with the link up below. Wow great selection and good luck to all who enter. Have a fabulous Friday. Congratulations. I really enjoy your posts. Happy Blogaversary. Woo wooooo! Almost time for your blogiversary!!! Wow, what a fantastic giveaway! Some pup is about to be very lucky :) Happy almost blogiversary! Wow one year is super exciting!!!! I remember a looong time ago when it was one year for us! What fun! Good luck to all who enter and HAPPY ONE YEAR BLOGOVERSARY early! That sure are some great stuff. That is like the canine Oprah's Favorite things! We'll be back tomorrow to congratulate you on your one year blogiversary. I think you've really accomplished a lot in a year! Whew, not thats a huge give-a-way...we will be there...can't miss a blogoversary!!!!!! Happy One Year Blogiversary! The pups love the Louisiana Alligator treats...Mommy wouldn't mind winning the autographed versions of your "Returns"! See you tomorrow for your Blogiversary! Wow one Year is great! Happy Blogiversary! My "pack" sends greetings. Five Treeing Walker Coonhounds (Suki, Ran, Kenji, Kyoko, and Seiji) and three cats (Koneko, Moko, and Arata) - all rescues - send their best wishes, too, and are keeping their paws crossed we win! That was a terrific giveaway. Thanks for being so nice! Okay and now mommy's got an earworm: "these are a few of my favorite things...!"" That was a pawesome giveaway!